The left disk is seen face-on. The narrow disk on the right is tipped nearly edge-on from our point of view. The black central circles are produced by the camera's coronagraph, which blocks out the star so its fainter surroundings can be imaged. Debris disks discovered around two nearby stars look strikingly like the Kuiper Belt in the outer part of our solar system, astronomers said today. 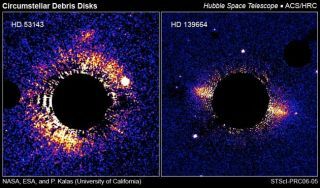 The disks were found in a survey of 22 Sun-like stars by the Hubble Space Telescope. By blocking out light from the central stars, Hubble was able to image dust and other material around the stars. The stars are about 60 light-years away, and the shape of their disks have astronomers pondering the long-debated possibility that our own Sun might have an as-yet unfound companion dubbed Nemesis. Each of the two disks has a sharp outer edge that might be caused by an unseen companion star that gravitationally grooms the material. Our own Kuiper Belt, which contains comets, Pluto and other frozen worlds, is thought to have similarly abrupt outer bound. Unlike younger stars with debris disks-thought to be the stuff of planet formation-these two stars are more than 300 million years old. Things have likely settled into somewhat stable configurations with planets and well-defined debris streams, perhaps similar to our own solar system, which is now 4.6 billion years old. "These are the types of stars around which you would expect to find habitable zones and planets that could develop life," said lead researcher Paul Kalas of the University of California, Berkeley. The findings will be reported in the Jan. 20 issue of Astrophysical Journal Letters. The small sampling of debris disks that have been discovered shows they fall into two categories: those with a broad belt, wider than about 50 astronomical units (AU); and narrow ones with a width of between 20 and 30 AU and a sharp outer boundary, probably like our own Kuiper Belt. An astronomical unit, or AU, is the average distance between the Earth and Sun, about 93 million miles. Our Kuiper Belt is thought to be narrow, extending from the orbit of Neptune at 30 AU to about 50 AU. Most of the handful of known stellar debris disks seem to have a central area cleared of debris, perhaps by planets. Kalas and Graham speculate that stars also having sharp outer edges to their debris disks have a companion-a star or brown dwarf-that keeps the disk from spreading outward, similar to how Saturn's moons shape the edges of some of the planet's rings. "The story of how you make a ring around a planet could be the same as the story of making rings around a star," Kalas said. Perhaps a passing star ripped off the edges of the original planetary disk, but a star-sized companion, remaining in place, would be necessary to keep the remaining disk material from spreading outward, he figures. The scenario has Kalas and his colleagues thinking that the Sun might also have a companion that keeps the Kuiper Belt confined within a sharp boundary. U.C. Berkeley physics professor Richard Muller has proposed such a star, which he calls Nemesis, but no evidence has been found for one.